Paper or non-woven wallcoverings naturally spring to mind when you think of wallcoverings. However with the unique Intrigue collection Arte has once more taken the concept to a completely different level. And even if you have perhaps seen a wall covered with a textile, well, this is just a little more refined. 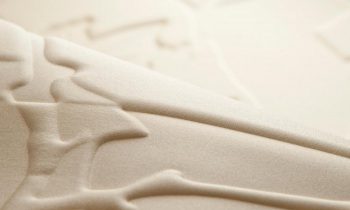 The Intrigue collection is the result of a new process that we call thermoforming. As the word might suggest, heat is used to press a design into the fabric. By heating the fabric it acquires a luxurious satin sheen that reflects the light. It is fascinating to see and irresistible to touch. You also obtain a beguiling interplay of smooth and relief, light and dark, sheen and matte areas. Three-dimensionalThis collection features three different designs. The first print, Rosace, is a more graphic design with regular triangles, three-dimensional of course. This produces ‘rise’ and ‘fall’ that showcases the subtle sheen effect. The second design, Caisson, was inspired by a wonderful, old, sculpted panel door, such as those you frequently encounter in the smallest streets of Paris. Design number three, Feuillage, is a tile pattern of leaf designs. The colour palette is equally pronounced and irrefutably demands your undivided attention. The colours in this collection boast captivating names such as Avorio, Prussia, Fondant, Perla and Felce, which make your imagination run wild. 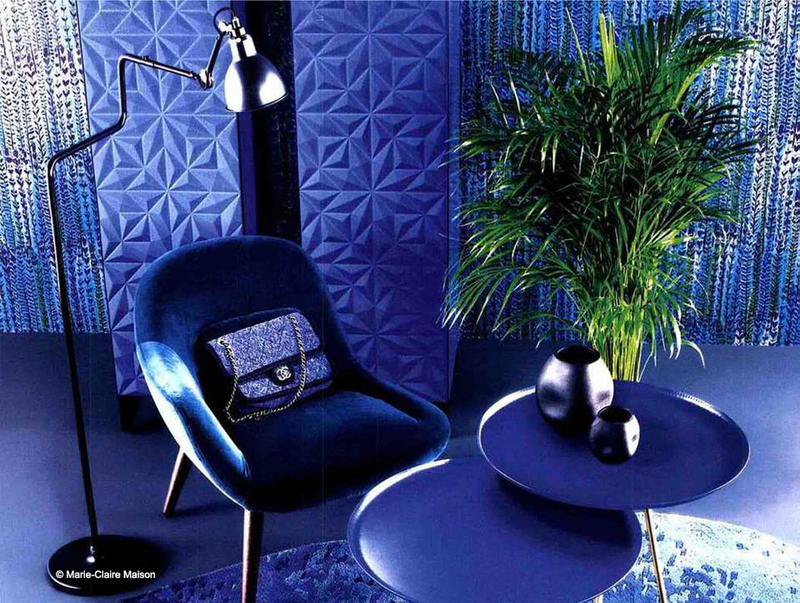 So do you dare to decorate a wall in black, bright blue or poisonous green? As a personal statement? Or do you prefer to play it safe with a more restrained tone? SoundsuppressingIntrigue offers another advantage. 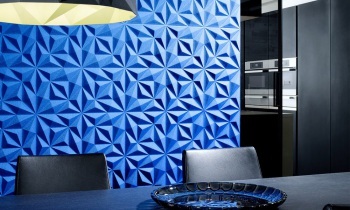 As a result of the combination of materials used,this wallcovering will influence in a positive way the acoustics in areas where the wallcovering has been installed. It means that voices are immediately muffled in large rooms. Because the Intrigue collection is produced from supple material, it is also a valuable product for adding a touch of style to less attractive walls. Intrigue is actually highly flexible and very intriguing.